Another eight HepsNation athletes booked their tickets to the NCAA finals in Eugene, Ore. at the East Preliminary Round in Jacksonville, Fla. yesterday. This is nothing new for seven of the eight athletes as these seven have previously participated in the finals. Meanwhile, another two athletes advanced to their event quarterfinals and will compete again later today to see if they too will make it to Eugene. 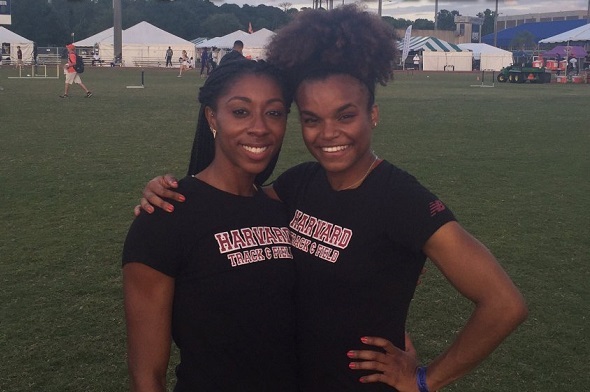 Harvard’s hurdling duo Autumne Franklin and Jade Miller booked their return trips to Eugene in spectacular fashion early Friday evening. Franklin clocked the fastest time among all East Region qualifiers in the 400m hurdle quarterfinals, 55.12. That time is not only a personal best for the Crimson senior but also a new Ivy League record, breaking the former mark of 55.46 held by Olympian Brenda Taylor back in 2001. Miller’s quarterfinal time also improved her standing in the Ivy League record book. Her time of 55.75 is the third fastest ever among Ivy Leaguers and was the seventh best in the competition. Miller was a First-Team All-American in this event last year, while Franklin was Second-Team. Taysia Radoslav of Cornell came within 0.005 seconds of returning to Eugene but unfortunately, she was the first one to miss the cut as she had the 13th fastest time in the quarterfinals. Franklin and Miller will be joined by two teammates in Eugene – Nikki Okwelogu and Paige Kouba. Okwelogu made the qualification cut for the discus throw for the first time, throwing 179-07 that was the fifth best mark in the competition. Top 12 throws advance to Eugene. Meanwhile, Kouba earned an automatic berth in the steeplechase by finishing second in her heat with a time of 9:59.10. Penn senior Sam Mattis will get the chance to defend his discus title in Eugene as he finished second overall in the qualification round. His best mark was 203-03, a little over two feet back from the top qualifier of the day. Rob Robbins finished eighth overall in the javelin preliminary round, as his best mark was 228-02. The Cornell senior has previously qualified for NCAAs before in 2013 where he finished ninth, earning Second-Team honors. Princeton’s Cecilia Barowski and Dartmouth’s Kaitlin Whitehorn are looking to earn First-Team honors this year in the 800m and high jump, respectively, after getting Second-Team honors last year. Barowski clocked the fourth fastest 800m time in the quarterfinals with 2:03.64 while Whitehorn had the fourth best performance in the high jump by ultimately clearing 5-10 3/4. The one HepsNation athlete who will be heading to the NCAA final for the first time is Jordan Mann. The Brown alum will be representing Providence College in the steeplechase, where in yesterday’s semi-finals, he ran the third fastest time in the field with 8:38.28 – a 14 second personal best as he entered the Preliminary Round with a personal best time of 8:52.36. Cornell’s Max Hairston and Harvard’s Gabrielle Thomas advanced out of the first round by securing automatic berth in the 110m hurdles and 200m, respectively. Hairston ran 13.90 in the hurdles which was the twelveth fastest time in the field. Thomas ran the second fastest 200m of her career with 22.91, which was good for fifth fastest in the competition. Hairston and Thomas will join our 1,500m quarterfinalists – Dartmouth’s Dana Giordano, Columbia’s Olivia Sadler and Rob Napolitano, Yale’s Frances Schmiede and James Randon, Cornell’s James Gowans, Princeton’s Garrett O’Toole and Noah Kauppila, and Penn’s Chris Hatler – as well Harvard’s two relays and our entries in the 5,000m, triple jump, shot put, and men’s high jump to see if they will join our other 12 NCAA finalists to Eugene. This entry was posted on Saturday, May 28th, 2016 at 6:40 am. It is filed under Athletes, Spotlight. You can follow any responses to this entry through the RSS 2.0 feed.